Cabbage cooked the Southern way by sauteing in bacon grease and steaming until tender. Some people crave stuff like chocolate or potato chips. I crave stuff like cabbage or coconut pie. I can prove this by telling you that when Husband went to the kitchen for a snack last night he came back with a bag of ketchup chips (it’s a Canadian thing… I dunno) and some thin mint cookies. When I went to the kitchen for a snack I came back with the leftover cabbage from supper. Then he told me I was gross and I told him I was the one with a healthy colon. I posted an unofficial survey on the facebook page asking what people called this dish. We just always called it “cabbage.” If someone told me they were serving cabbage, this is what it meant to me. The majority of folks called this Fried Cabbage so that’s what I’m going to call it too. This “frying” method is really just sautéing it in a little fat then covering with a lid so the water that’s released from the cabbage can steam it. This is also exactly how I cook collard greens (and mustard or turnip greens). Cut the head of cabbage into quarters and remove the core from each section. Chop cabbage into 1” pieces and set aside. Heat bacon grease in a large skillet over medium-high heat. Add cabbage and toss to coat. Add salt and pepper to taste. Sauté cabbage for about 10 minutes. At this point your cabbage should start releasing some of its water. If it doesn't, and your pan is mostly dry, add chicken broth or water and toss to coat. Cover skillet, reduce heat to medium-low and continue cooking cabbage, stirring occasionally, for approximately 30 minutes or to your liking (I be liking mine a tad al dente). *Substitute vegetable oil for bacon grease if necessary then ask the Lord for forgiveness for throwing away your bacon grease. **This may not be necessary. Sometimes my cabbage puts out a lot of water, sometimes it doesn’t. See directions for determining whether to add chicken broth or water. Love this recipe, I also add about a Tbs. of sugar to it. Gives it a just a hint of sweetness, very yummo!!! I also make mine with a bit of sugar when I add the water, salt and pepper! This is one of my daughter's favorite comfort foods, which is unusual for a 19 year old to like cabbage at all these days..lol! She and I can sit and polish off a whole pan full of this! Now add some onion and home made egg noodles , you'll have a plate of heaven. 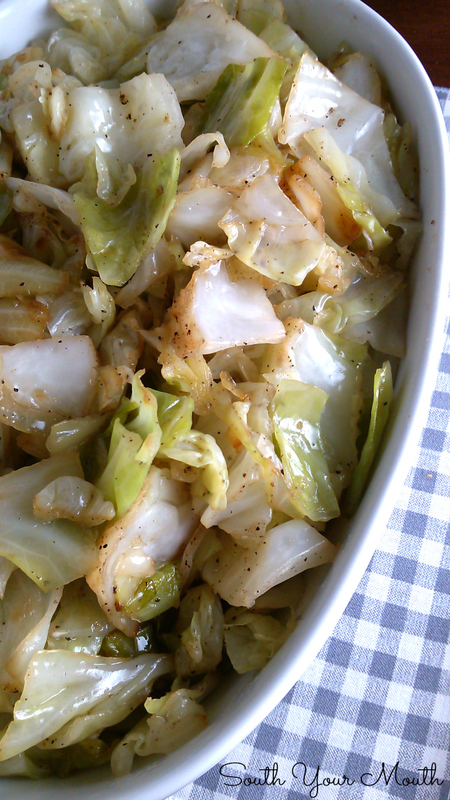 I like to chop a medium onion, seems to bring out the sweetness of the cabbage. Try coconut oil for a different and healthier oil - a scant tablespoon full will do it. I find that if I use Vidallia onions there is no need for anything else, as they are naturally sweet. Had this exact same meal last night with the addition of home made baby lima beans to go with the cabbage and corn bread. Yummy!! I get teased all the time because most of my recipes involve bacon grease! Apparently I am the only person in my circle of friends that keeps a mug of bacon grease in my refrigerator! Certainly must be a southern thing! I adore fried cabbage. I start it frying in the pan with the bacon grease, do the steaming thing with the lid and then I sprinkle on a tiny bit of sugar and fried it again. It gets a pretty brown and tastes like heaven! At my house, we store bacon grease by pouring it in and ice tray and letting it harden and then pop it out and store it in a freezer bag in the freezer. Good idea.AND adding noodles to the cabbage you have a Slovak dish which is amazing . My mama used salt pork and a little bacon grease. Always wondered what it was called because she used to call it smothered cabbage which just confused everyone. Sooo good. I like the smoked sausage and onion idea. My cousin some times adds green bell pepper but he also has too much liquid. Craving it now. I call that steamed cabbage. If I cut it in thinner strips and saute it in a little butter, I call that fried cabbage. Either way... I call it delicious! I've always called that cabbage. All this time when I hear someone say fried cabbage I picture cabbage lightly breaded and fried LOL! Anyways I just found your site and it's amazing. 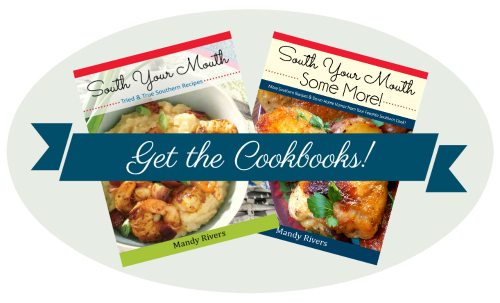 I love to cook - grew up in Dothan, AL. I saw your comment you grew up in Dothan, AL. I grew up in Cottonwood. Small world. Love fried cabbage. Mom made them with bacon grease and onions. Yummmmly. I cut bacon up & fry that along with cabbage, onion & sometimes fresh mushrooms, I've never added any liquid & it's soooo good! I also fry bacon with my burger when I make goulash, makes a great flavor change! I usually fry bacon and onion with it! Great side dish. 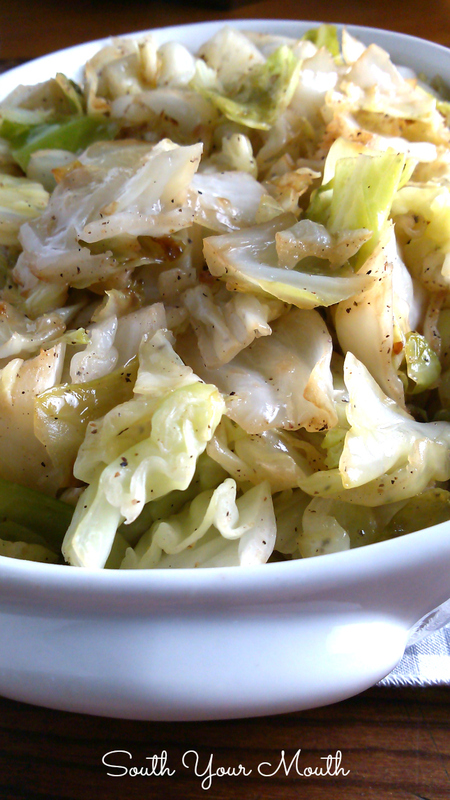 This is a great recipe for delicious but simple fried cabbage, love it! Call me crazy, but I"m not sure what you mean by substitute vegetable for bacon grease? Could you explain that? The only thing I omit is the chicken broth/water. I add to it some sugar and apple cider vinegar:))) Really, really good! Gonna try this, I love apple cider vinegar. I can't use the bacon grease so I use unflavored coconut oil instead and throw in a few slices of jalapeno for a little heat. I love stir fried cabbage. Most of my family like it "boiled" but I find that flavorless. I pretty much use your recipe but I do sprinkle in a bit of sugar. I also use the bacon fat that I reserve and refrigerate when I fry out bacon. The bacon I use in this dish is the "real" bacon bits that I keep as a pantry staple. Really yummy. Add bacon and some sauerkraut and bake it covered for an hour and you have a dish called Kapusta. What type of cabbage is preferred by most..Savoy or White? My cabage comes out tough. Help!